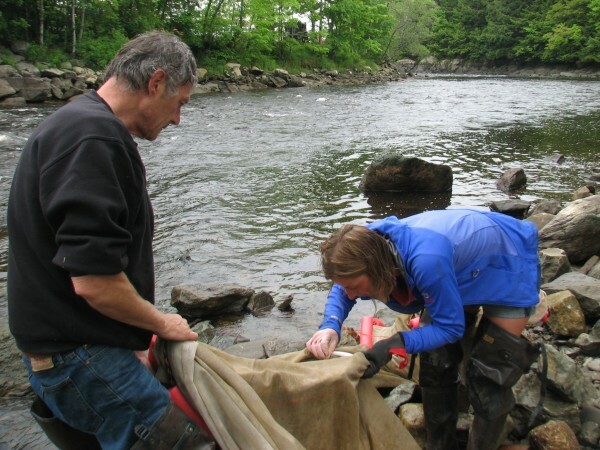 Dave Pelletier of Surry (left) and Jessica Card of Franklin examine a fyke net for stray elvers as they dismantle the net on the shore of the Union River in downtown Ellsworth on Thursday, May 31, 2012. 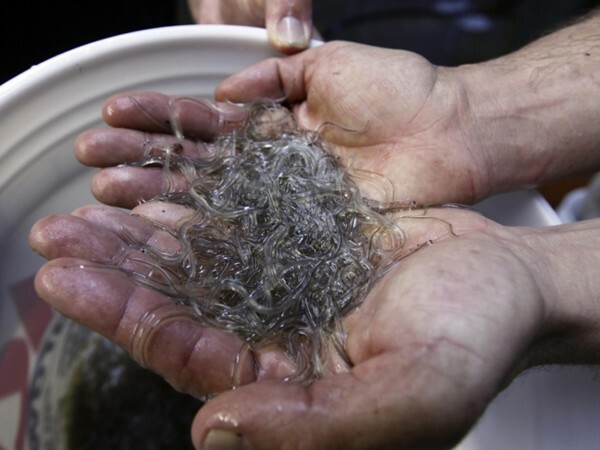 Thursday marked the end of the 2012 elver fishing in Maine, which saw prices for the juvenile eels soar to $2,600 per pound, nearly triple the average price in 2011. Fishermen in Maine and South Carolina are reaping profits upward of $2,000 per pound for elvers. Jonesport fishermen Braden Alley (left) moves rocks to used as weights as Joe McDonald cleans the net the two will use to catch elvers on Wednesday, May 9, 2012 along the Kenduskeag Steam in Bangor. The small eels caught will be shipped to Asian countries were they will be raised to full grown eels before being sold to restaurants. ELLSWORTH, Maine — Elver fishing for 2012 came to a close at noon Thursday, but not before the price for the juvenile eels again soared to unprecedented levels. The going price this week for the small, transparent eels was $2,600 per pound. That’s approximately three times the $891 per pound that fishermen were paid on average for their catch in 2011, which at the time was considered an astronomically high price. Before last year, the highest average annual price elver fishermen had received for their catch was in 2007 when they earned $346 per pound, according to state statistics. The total statewide value to fishermen of the elver harvest in 2011 was $7.6 million. Officials have said the price spike has been fueled by tighter limits on eel harvests in Europe and destruction of eel stocks in Japan from the devastating earthquake and tsunami that struck in March 2011. Continued high demand in Asia for eels has made elver licenses highly sought-after items in Maine, where many fishermen have said the 10-week elver season is responsible for much of their annual income. Maine and South Carolina are the only two states where elver harvesting is permitted. Dave Pelletier of Surry, who runs a print shop in Ellsworth when he’s not elver fishing, said the high price has provided a big financial boost to many people in eastern Maine. To help protect eel stocks, the Maine Department of Marine Resources has capped the number of elver licenses at 407. The Passamaquoddy Tribe, which has the authority to issue licenses on its own, stirred up controversy in early May when it issued 236 elver licenses to its members without consulting with DMR. Though elver fishermen in Maine say there seemed to have been plenty of juvenile eels in the state’s tidal waterways this spring, the federal government is considering listing American eels as endangered or threatened, which could result in a ban on elver fishing nationwide. Elvers spawn in the Sargasso Sea in the Atlantic Ocean and then migrate each spring to shore and into fresh water, where they grow into adults that eventually return to sea to breed. Ray Brann of Friendship, who is licensed to buy elvers for a dealer in Dresden, was conducting business on Thursday out of a white van parked just off Water Street in downtown Ellsworth. A retired fisherman, Brann said the elver industry has been good for the entire state. Brann added that it would be a shame if elver fishing is banned in 2013 and that revenue is lost. “That’s a concern,” he said. Maj. Alan Talbot of Marine Patrol, the law enforcement division of DMR, said Friday there have been a lot of elver fishing violations this spring, most of which have involved people fishing for the small, transparent juvenile eels without licenses. “There was a lot more poaching,” he said. The “vast majority” of elver violations issued by Marine Patrol over the past two months are pending in court and have yet to be resolved, Talbot said. Whether higher penalties for illegal elver fishing approved by the Legislature in March are proven to be effective, he said, depends on how most of those cases turn out. “We hope the high fines will have some effect,” he said. Despite the economic benefits enjoyed by those with elver fishing or dealer licenses, Talbot said the end of the elver season means some relief for his officers, who now have more time to pay attention to their year-round duties such as monitoring lobster catches and responding to emergencies. He said it is too soon to tell how many pounds of elvers were caught in Maine this spring, but regardless of the volume it has been an “extremely busy” season for Marine Patrol. “It’s been the busiest [elver season] in the last 10 years, certainly, and all because of the price,” Talbot said.